#54. Which path leads to church? 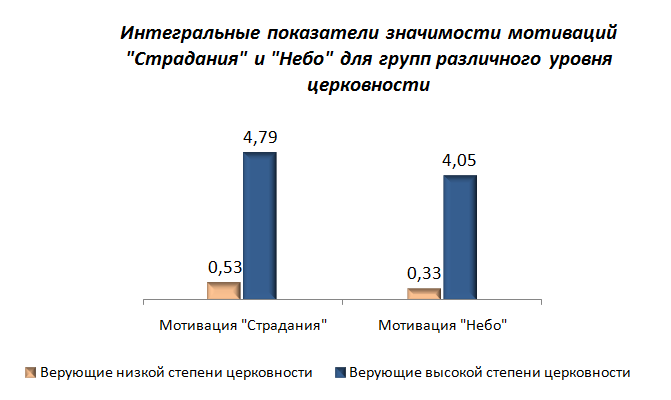 : Non-profit research based consulting "Sreda"
Опросы > Survey > #54. 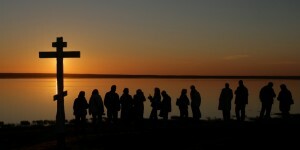 Which path leads to church? 1. The influence of the family, or religious upbringing 2. Grandmother is a believer 3. Sunday school 4. Unreturned love 5. The influence of the husband (wife), life partner (companion) 6. My own illness 7. Illness of loved ones 8. Death 9. Organized talks on spiritual topics (at a religious center, church, mosque, school, interest club, etc.) 10. The active work of the parish in the community (at school, at work) 11. Communicating with beleivers, friends are believers 12. Dialogue with representatives of the clergy 13. Reading spiritual books 14. Articles about faith in magazines, newspapers, and transmissions about faith on the radio or on television 15. Internet, discussion on matters of faith on religious sites and in communities 16. Participation in charity, social work 17. Assistance received from believers 18. Happy, joyful circumstances (“great joy”) 19. Sad, tragic circumstances (“great grief”) 20. 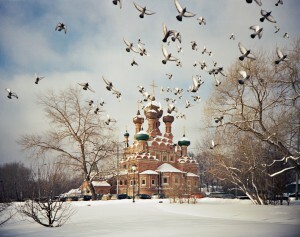 Search for cultural and national identity 21. Reflections on the meaning of life, the spiritual search 22. The rejection of the modern world – too materialistic, where everything is bought and sold 23. God led me They were permitted, in addition, to give the following responses: “Other”, “Do not know”, and “No Answer”. The analysis of field data identified the main factors that lead people to church, as well as a comparative analysis of the responses of different groups of respondents was held. It became clear that the dramatic life events are very important for people with either low or high level of church life. However, the latter group, according the proverb “Until the thunder claps, the peasant will not cross himself”, also shows a very high motivational significance of Divine Providence, traditional family upbringing, and horizontal linkages in the community. I. Who are the “undecided”? In the overall results of the survey, the vast majority of respondents are not able to identify the reason that prompted them to start visiting church. “Undecided” responses were popular among people of all socio-demographic groups, and the variant “No Answer” was preferred to the response “Do not know”. Who are these people? The first answer comes to mind – “they really do not go to church, and therefore respond similarly” – it is true, but only partly. Indeed, in the sample of respondents who regularly attend services (8% of total respondents), there are no “undecided”. That is, if a person identifies himself as a regular attender of worship, then surely he names the reason. This thesis is supported by the fact that absolutely all unbelieving respondents – 6% of the total number of respondents – are classified as “undecided”. However, this explanation is not unanimous. How are the 68% of the “undecided” distributed within the remaining 92% of the respondents? To give a precise answer in this study is difficult, but if we take into account the proximity of people to the Church, the following trend is revealed: the further away people are from faith, the less they are involved in a church life, the more likely they are classified as the “undecided”. We will explore the nature of this relationship in more below. 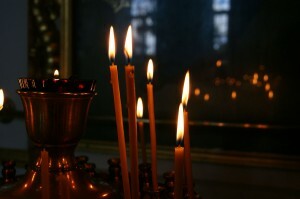 For example, among “those who believe in God, but do not profess a particular religion,” four-fifths are “undecided”, of orthodox believers not belonging to the Russian Orthodox Church – 69%, of those who constantly wear a cross – exactly half, of those who comply with the basic religious precepts – 48%, (and even the same number of Orthodox ROC), of active members – 35%, and of the audience of Christian media – 30%. FACT: Among respondents who distrust Patriarch Kirill, “undecideds” are a quarter more than among those that trust him (78%: 61%). 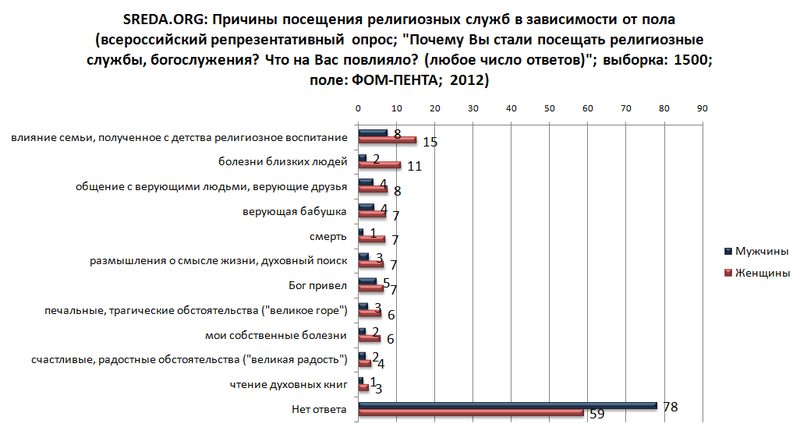 FACT: Among the non-Russian respondents, ‘undecideds’ are a quarter more than among Russians (83%: 66%). FACT: In the sample of respondents who are superstitious, the percentage of “undecideds” is only slightly smaller than the all-Russian percentage. 2. Where do the “undecideds” live? They are far more likely to be found in the Far East and Urals federal districts (86% and 84%, respectively). FACT: In only two federal districts – Central and Volga – the percentage of “undecideds” is inferior to the all-Russian, but here these people are also in the majority. 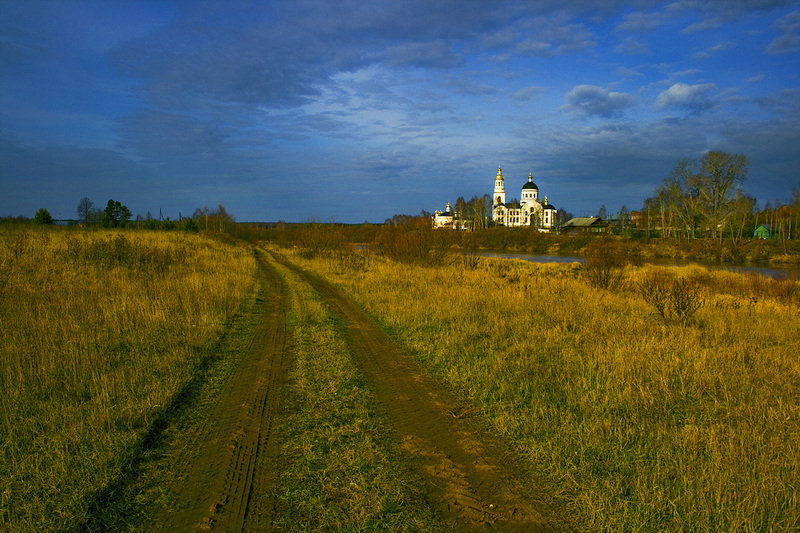 In Moscow, the share of the “undecided” is minimal (52%), while in the countryside – the maximum (78%). 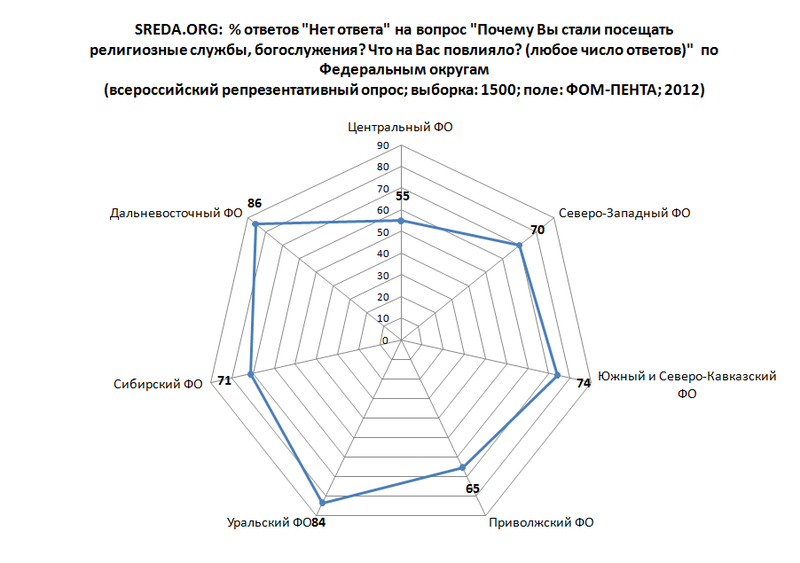 The study of the socio-demographic characteristics of the “undecideds” shows that they roughly equally represent major groups and strata of Russian society. 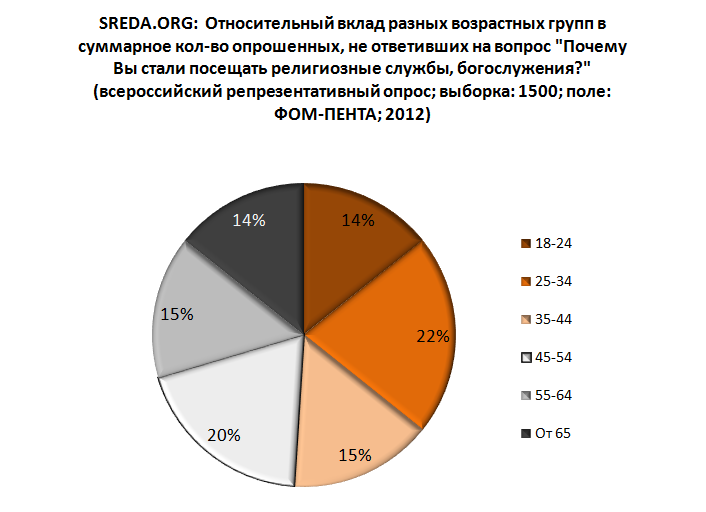 Thus, the demographic distribution of the “undecideds” by age is almost the same as the all-Russian. The same can be said about their education, wealth, and occupation. FACT: Among the representatives of various occupations, workers represent the highest number of “undecideds”: 73% of workers did not give a definite answer (the statistical weight of the sample itself is significant – 24%). FACT: In the various sectors, the relative proportion of “undecideds” is highest in agriculture (85%). FACT: “Undecideds” are less likely to be found among health care workers. Here they are in the minority (48%). The most popular eight reasons outlined in the above list, are 1, 2, 7, 8, 11, 19, 21 and 23. 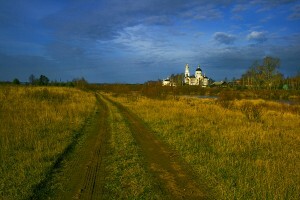 These are the main “paths” that lead modern Russians to church. As you can see, the first couple belongs to a traditional family upbringing, the second pair – tragic life circumstances. Other reasons could be classified as education (self-taught) (statement number 11), a over emotional perception of the world (statement number 19), a rational analysis of what is happening (statement number 21), and an irrational mindset (statement number 23). Who prefers certain kinds of answers? In all statistically significant samples the main “driver” that causes people to attend religious services, is religious upbringing. With very few exceptions, all over, the leading reason was: “the influence of the family, resulting from a religious upbringing.” Often, people point out another reason from the same category, recalling the importance of a believing grandmother. This was often chosen by the top-managers and businessmen, younger respondents, and those with less than secondary education. FACT: For women the second most important reason is illnesses of loved ones, and the third – communication with believers, friends who are believers. If we analyze most frequently mentioned responses in different age cohorts, we can draw the following conclusions. A believing grandmother’s personal example is a very important cause to those up to the 25-year milestone. However, this this falls to second place; and the illness of loved ones, the example of believing friends, and of the irrational “God led” rise to first, and then – in individuals of pre-retirement and retirement age – even death. People with higher education give one the leading answer (the statement number 1). In addition, these people draw attention to reasons such as illness of loved ones, and reflections on the meaning of life (spiritual quest). A different picture is found in the Volga Federal District. Here we get clear quartet of leaders: religious upbringing (11%), examples of one’s grandmother and believing friends (10%) and illness of loved ones (9%). But the center of the European part of the country is dominated by the tradition of family education: it is referred to by two out of nine respondents. Far behind – the trio of “silver medalists”, each collected by 8% of mentions, “illness of loved ones,” “spiritual quest”, and “God has led” (grandmother’s example falls in the middle of the rating). 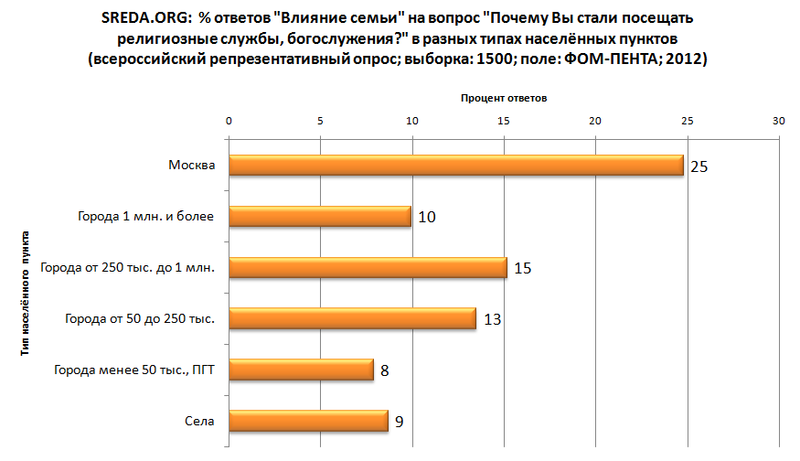 Family education has even more effect on Muscovites: its importance in the capital mentioned every fourth respondent. Then comes “God has led” (11%). Grandmothers and believing friends were mentioned in 9% of responses. FACT: In cities with population ranging from 50 to 250 thousand people, respondents mention “religious upbringing” (13%), “illness of loved ones” (11%), and “God led me” (9%). FACT: In the Volga Federal District, communicating with believing friends is most important. This reason shares the second place with a personal example of one’s grandmother. III. Important cause coefficients – the importance of a path to church. Most often in sociology, the characteristics of this or that are compared with the general sample. We decided to act differently: we shall compare the answers of the respondents with the answers of people who regularly visit churches. How important is this or that reason to attend worship services for the average Russian? It is possible to analyze this by entering the “Important cause coefficient” – the quotient between average response in the general sample and the sample of people who regularly attend worship services. If a coefficient value is zero it means that the reason does not matter, if it is 1, it means the reason is just as significant for “general Russians” as for the people who attend church services regularly; the larger the values the greater the significance of this or that reason. The important cause coefficients (ICC) was calculated for the entire population, as well as for several groups of respondents: those who observe Lent, and those who follow the Ten Commandments, compared to the rest of the population. Thus, the most important ways to encourage people to go to church, are not equivalent. Communication with believers is important among those observing Lent, and seriously loses its significance among those observing the commandments. In the entire sample of respondents, it is twice as less significant when compared to family upbringing and to dramatic life events (great grief, death, or illness of relatives). In addition, this interpretation allows us to make two important comclusions. First, it confirms the hypothesis that a higher percentage of “undecideds” shows the involvement of respondents in church life. Second, it allows us to compare the relative importance of different reasons. Thus, we see: personal example of a believing grandmother keeps high importance in almost all groups. On the contrary, the reason “God has led” is almost always less significant. 2. Less important reasons: own illness out of the competition. A dozen other factors were significant to a much lesser extent. But among them is the clear group of phrases, which, however, are important in some samples. First of all, is the reason “my own illness”. It was mentioned by 6% of women, 7% of pensioners, 10% of educators, 14% of people regularly attending services, and 10% of parishioners. Also, worth mentioning are the phrases “influence of husband / wife” (5% of the audience of Christian media), “Communication with representatives of the clergy” (9% of those who regularly attend services, and 8% of observe Lent), “reading spiritual books” (15 % of those who regularly attend services, and 8% of observe Lent), “received help from believers” (7% of attending the service), “happy circumstances” (9% of attending the service) and the “rejection of the modern world – too materialistic” (11% of the audience of Christian media). The following ICC values for some of the phrases are calculated for the entire population, as well as for samples of those people observing Lent, and the audience of Christian media (the relative proportion of “undecideds” in them is respectively 40% and 29%). This data is generally in good agreement with the above qualitative conclusions: as the percentage of “undecideds” falls, the ICC value increases, and in the intermediate samples it grows much faster for reasons that describe circumstances of life (especially dramatic or even tragic). Eight other factors are virtually absent among the paths that lead to church, and their role is insignificant. 3. Life beats or the Lord leads? According to the famous Russian proverb, until the thunder claps, the peasant will not cross himself. We have just seen that in different groups of the society this is true to various degrees. But to what extent are these differences significant? We have attempted to estimate the total value of four “dramatic” reasons (items 6, 7, 8, and 19) and four reasons that can be described as Providence (positions 1, 2, 11, 23). For all causes, from both the first and second sets, we calculated ICC values for 4 samples: 1. those who believe in God, but do not profess a particular religion, 2. those who do not observe commandments, 3. people with high sense of belonging to the parish, and 3. those who observe Lent. Obviously, the first pair of samples refers to people relatively low, and the second – relatively high church involvement. Integral indicators of the importance of both groups were calculated as the sum of the ICC of the stated reasons for these samples, in line with the statistical weights of the latter. The coefficients of statistical weights are the proportion of respondents in the sample that gave at least one definite answer in the survey. Calculations showed that dramatic events are more important both for church people and for those who go to church on a case by case basis. 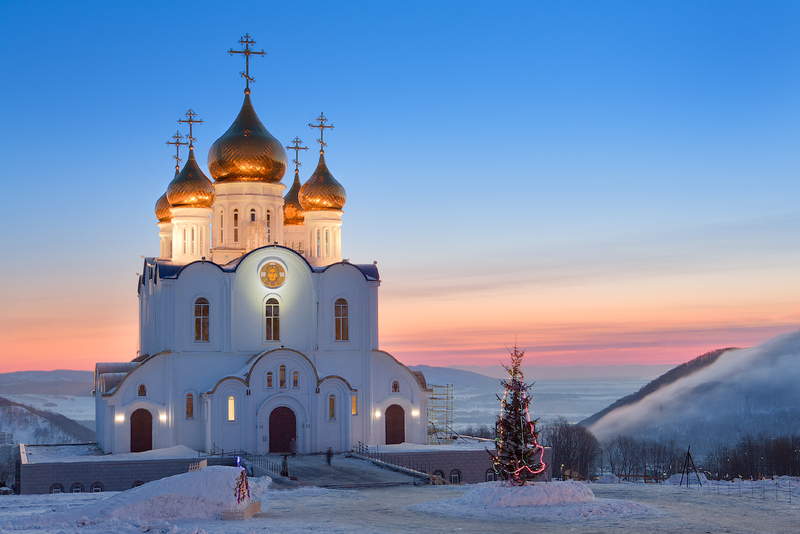 We analyzed the main motivations for Russians to attend worship at church. As it turns out, the majority of respondents found it difficult to choose one or another of the proposed reasons from the list. 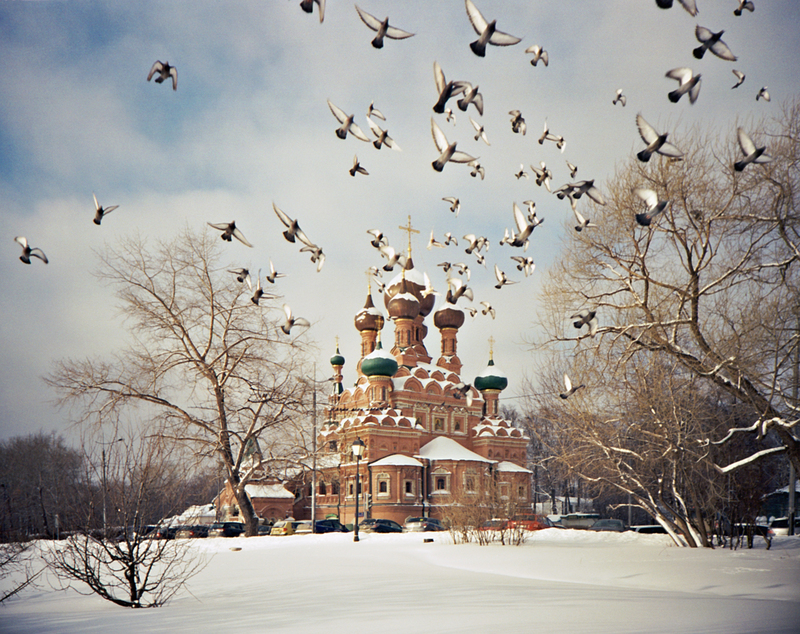 All the Russians who attend worship services regularly were able to identify what pushed them start going to church. 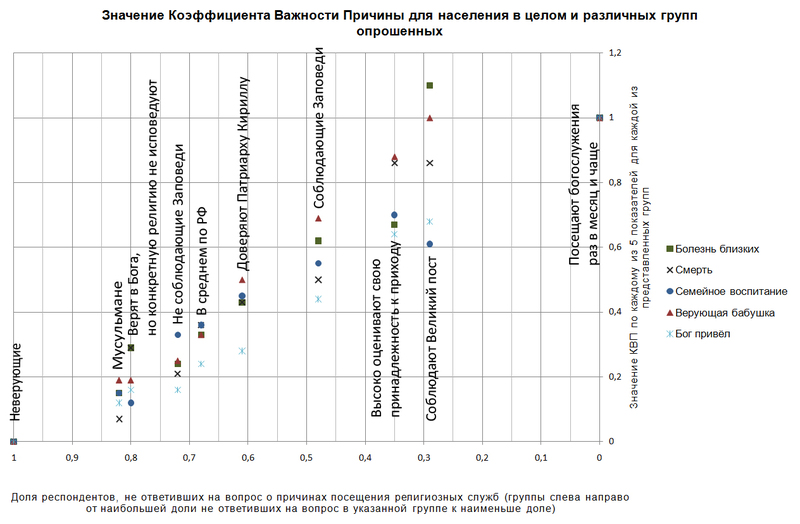 The analysis shows that the undecided people are rather homogeneous and represent the entire population of Russia on socio-demographic indicators. However, most of these people turned out to be in the Urals and the Far East, and least of all – in the center of the European part of the country and especially in Moscow. In groups of low and intermediate church involvement reasons connected with life circumstances are more acutely (they are mostly tragic – grief, illness, death of loved ones), and only when approaching a sample of people who regularly attend worship services, reasons connected with spiritual search and upbringing and general development will be identified with greater frequency.